Sweet, savory, lemony chicken with all that flavor. I can hardly stand it! Its too good to explain! This healthy and quick meal was from fridge to table in 35 minutes, with 30 of those being oven time. Serve over quinoa or with a side of Butternut Squash and Anise, this 1 pot wonder will keep 'em coming back for more. I had it for lunch the next day COLD and it was awesome! What can I say, I was between appointments and didnt have time to warm it. You get my point...try it and you'll see. Roasted chicken with Citrus Glaze is a week night treat. Toss some in the freezer once marinated (but before cooking of course) and you'll have a freezer bag meal for another night. Sounds great. Are these boneless skinless breasts? Yes they are boneless skinless Jule. 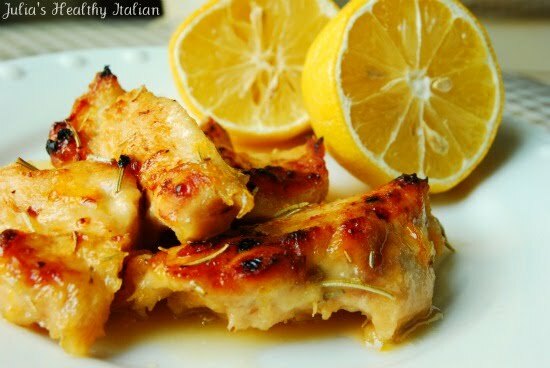 This sounds delicious, I love citrus with chicken! The anise and butternut squash sounds interesting! Well Julia, I made this tonight exactly as written and it was delicious and possibly the easiest chicken dish I have ever made. The sauce made itself and was great over rice pilaf. I thought it was going to be a super sweet kid type dish but the rosemary and garlic really balance the sweet ingreds. BTW Love being on this page with my two favorite bloggers. Don't know what I would cook if it wasn't for you and Gina. I made this dish last night and served it with a quinoa pilaf, and it was deeeelicious! Super easy and so very good. This will definitely become one of my quick go=to recipes! Thanks!! I made this for dinner last night and it was delicious. I used reduced sugar marmalade and agave nectar in place of the regular marmalade and honey. Thank you for the wonderful recipe!! This is easily going to become a favorite. I love this recipe-- the chicken is so tasty-- but both times I made it, the excess marinade boiled up and burned the sides of my pan like crazy. I had to use the baking soda and vinegar trick to get it all off! I'm using a pyrex pan. Do you have any suggestions for preventing this from happening? I've made this dish last Sunday for our reunion and my friends totally love it and keep asking me the recipe of this. I though the outcome will be overcooked because I've preheated it at 475 for 35 minutes in my deni convection oven and I'm so thankful that it turns out to be what I've expected.. Thanks for your recipe. Keep it up! So I'm starting the Feingold diet for my son, and can't use oranges, but lemons are good. I was wondering if this might work with some other kind of preserves instead of orange marmalade...maybe pineapple, fig or pear preserves? I know it would change the taste significantly, but I still wondered if you think it would still taste good with a Feingold acceptable fruit instead. Thank you!